The British Geological Survey‘s much awaited, and much speculated upon, report on shale gas resources has finally been released, covering the Bowland Shale in central England. “This large volume of gas has been identified in the shales beneath central Britain, but not enough is yet known to estimate a recovery factor, nor to estimate potential reserves (how much gas may be ultimately produced)”. “Only with further shale gas exploration drilling and testing over an extended period, and optimization of the extraction process, will it be possible to determine whether this identified shale gas prospectivity can be exploited commercially – and how significant a contribution it could make to the future UK energy mix”. So, there is lots of gas (and hot air in the media) but we are not actually much the wiser. Can it be that the politicians and journalists haven’t read what the report actually says? Setting the very considerable local environmental concerns on one side for a moment, the elephant in the shale gas room is global climate change and greenhouse gas emissions. Limiting global warming to manageable levels is a tremendously challenging task both nationally and globally. Even excluding unconventional gas there are far more known fossil fuel resources in the world than we could ever responsibly (or legally) burn. DECC are also producing a study on the potential greenhouse gas impacts of shale gas but this report is never mentioned. It seems like a rather significant omission in the unconventional gas policy debate. When will this report be released? Unconventional gas, including shale gas and coalbed methane, is a massive distraction from the real issue of decarbonising our energy sector and economy. Unconventional gas is not a credible transition fuel (it is a filthy fossil fuel which produces 500g CO2 per kWh of electricity generated and anyway there is not sufficient time to develop it), nor will it be cheap, nor will it provide energy or climate security. Michael Fallon, the responsible minister, has said that “Gas is the cleanest fossil fuel and it would be irresponsible not to encourage its exploration”. Many may think that is irresponsible for the government to ignore its independent, evidence-based, statutory advisor on climate change, the Committee on Climate Change, whose view it is that “decarbonisation of the power sector should be plan A – the dash for gas plan Z”. Plan A is also regarded as the cheaper and more secure option in the medium term. Just a few days ago the CCC warned that the UK may fail to meet its emissions targets in the 2020s. MPs from both main parties are currently calling for a Commons Debate on shale gas before the summer Parliamentary recess. What is your MP calling for? Of course in Somerset we are preoccupied with coalbed methane which is another kettle-of-fish and which is almost never mentioned by politicians, the media or in technical reports. 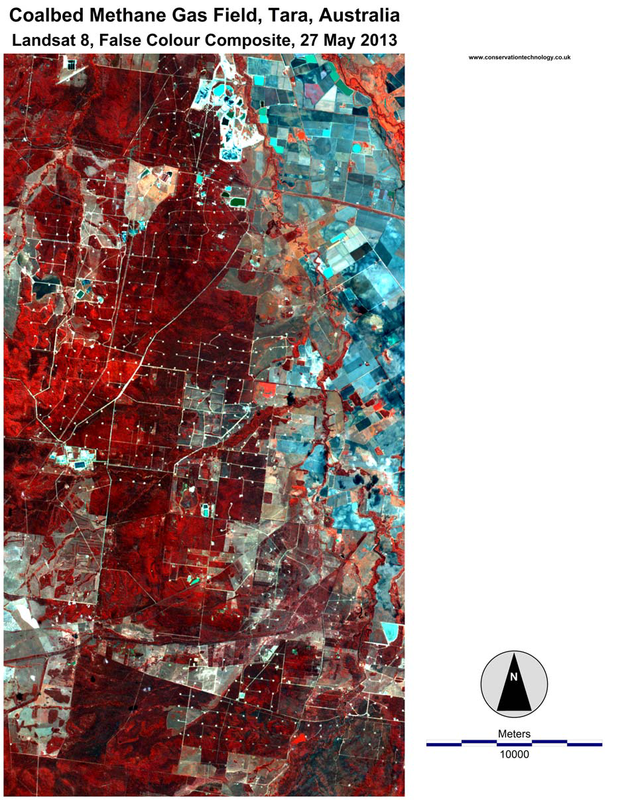 This is a Landsat 8 image of part of the Tara coalbed methane gas field in Australia, taken on the 27th May 2013. The image area is approximate 20km x 30km, the same as the Somerset PEDLs. The network of gas pads is clearly visible in a grid about 750m – 800m apart. The image is a near-infrared false colour composite that shows vegetation in red rather than green and which gives better feature discrimination. Landsat 8 image taken on 27 May 2013 of the Tara coalbed methane field in Australia. The area shown is approximately the same as the 20 km x 30 km PEDLs in Somerset. The image is a false colour infrared composite showing vegetation in red. The same PR advisor has said that without a community social licence to operate then unconventional gas in the UK ‘is not going to happen’. That sounds about right. The Australian company Eden Energy, which holds a 50% interest in the Somerset Petroleum Exploration & Development Licenses together with UK Methane, is to sell its interest to Shale Energy PLC for £10 million. This will be done through Shale Acquisition Ltd, which in turn is owned by Shale Energy PLC, an unlisted UK public company. The deal is contingent on verified estimates of recoverable gas and on the Department for Energy and Climate Change extending the PEDLs for “at least 12 months” from their expiry date of 30 September 2014. They intend to float the company on the AIM Market of the London Stock Exchange. Shale Energy describe themselves as an “acquisition vehicle” which to date has been active in the USA. You can read all about the deal on the Eden Energy web site. Soon you will be able to read all about it on the Investing in UK Shale section of the Shale Energy web site.